Basic Books (AZ), 9780465018314, 390pp. To contemporaries, the Wars of the Roses were known collectively as a cousins war. The series of dynastic conflicts that tore apart the ruling Plantagenet family in fifteenth-century England was truly a domestic drama, as fraught and intimate as any family feud before or since. 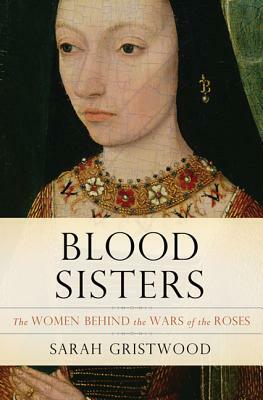 As acclaimed historian Sarah Gristwood reveals in "Blood Sisters," while the events of this turbulent time are usually described in terms of the male leads who fought and died seeking the throne, a handful of powerful women would prove just as decisive as their kinfolks clashing armies. These mothers, wives, and daughters were locked in a web of loyalty and betrayal that would ultimately change the course of English history. In a captivating, multigenerational narrative, Gristwood traces the rise and rule of the seven most critical women in the wars: from Marguerite of Anjou, wife of the Lancastrian Henry VI, who steered the kingdom in her insane husband's stead; to Cecily Neville, matriarch of the rival Yorkist clan, whose son Edward IV murdered his own brother to maintain power; to Margaret Beaufort, who gave up her own claim to the throne in favor of her son, a man who would become the first of a new line of Tudor kings. A richly drawn, absorbing epic, "Blood Sisters" is a tale of hopeful births alongside bloody deaths, of romance as well as brutal pragmatism. It is a story of how women, and the power that women could wield, helped to end the Wars of the Roses, paving the way for the Tudor ageand the creation of modern England. Biographer and journalist Sarah Gristwood attended Oxford University and has been a regular contributor to the London Times, Telegraph, Guardian, and Independent. She is the author of seven previous books, including the best-selling Arbella: England's Lost Queen and Elizabeth and Leicester: Power, Passion, Politics. Gristwood lives in London and Kent.